The Marjorams and Chahda's are the only thing that makes the series exciting. You really wonder what goes on in some people's heads. They have a Commodore, and want to run a two car operation, so they go and lease a Falcon? Surely to God there is a half decent Commodore out there they could lease so the data from each car is at least halfway comparable to the other? Otherwise what's the point running to cars to help speed up the learning process when the data isn't transferrable? It doesn't make a whole lot of sense. Both cars are Grandad's axe in reality. SO assuming his Co Drive gig is now about done and dusted unless he gets a call up from another 888 customer car which I doubt where now for for PD back to retirement. Any word on Pither, would be a shame to see a Championship winner having to sit out without a drive. On that Island in LOST. He's selling his old Ice Break car, and the Falcon he restored. Not sure what to make of it all. There was plenty of commentary after the Enduros were finished that it was the end for codriving, after a mistake at the GC in particular. Could all be scuttlebutt though? Just because you can, doesn’t mean you should! You said it fella!! So many dreamers, try-hards, and wanna-be's, I'll believe it when she is the 2020 Dunlop Super2 Champion. Otherwise just another dreamer able to round up more money than talent. 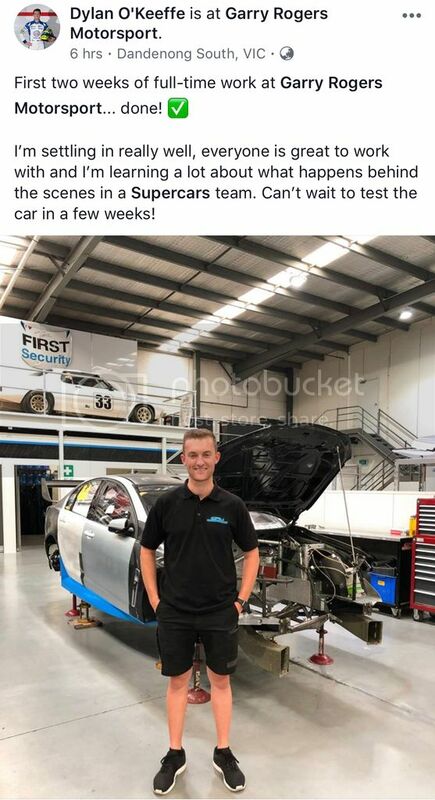 Isnt Mr Stanaway going to be the 2020 Dunlop Super2 Champion? Many thanks for your words of encouragement JAFA851 regarding Abbie been on the grid at Adalaide, I'll add you onto her list of supporters. Thanks Again. I didn't say anything about her being / not being on the grid at Adelaide. I have no idea how close ( or not ) she is to that. I just agreed with YOUR comment that talk is cheap. Look at how many young people, and the last few females, have come into the series with a hiss and a roar and talked themselves up and got all in sundry on the bandwagon, then done nothing, and disappeared shortly thereafter back to wherever they came from never to be heard of again? Not saying it will be the case again, and I'm happy to be proven wrong, but I'll wait until she starts getting some decent and consistant results before I start singing her praises. We'll have to wait and see then if it comes together and she gets the chance to show what Abbie can do. Tranquillity - What happens inside Shane's race car. Chaos - What happens outside Jamie's race car. Find More Posts by Just Do It!